Prime rib can be cooked in several ways, but slow-cooking is the best option for cooking a juicy, moist prime rib roast. You can accomplish this in the oven or a Crock-Pot. All it takes is a bit of preparation. The key to a fantastic prime rib roast is browning the meat before roasting. Preheat the oven to 350 degrees F. If you are using a Crock-Pot, turn the pot on low. Trim the fat from the prime rib roast, leaving no more than 1/4 inch fat layer on the meat. Heat the oil in a heavy skillet over medium-high heat until hot. Place the roast in the oil, fat side down. When the fat side is seared, or completely browned, turn the roast and do the remaining sides, approximately five minutes per side. Remove the roast from the skillet and place it in a roasting pan or in the Crock-Pot. Sprinkle with salt, pepper and other seasoning choices. Cover and place the roast in the oven or place the lid on the Crock-Pot. Roast the prime rib in the oven for approximately 20 minutes per pound for medium-rare prime rib. For a Crock-Pot, allow approximately six hours before checking the temperature. Use a meat thermometer to check the prime rib. 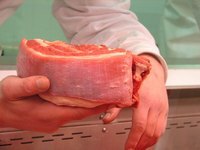 For medium rare, the internal temperature should be 140 degrees; medium well would be at 160 degrees; and well done would be 180 degrees or higher. Remove the pan from the oven and transfer the prime rib to a platter. Let the roast sit 10 to 20 minutes before serving. Pour the juices from the roasting pan or Crock-Pot into a gravy bowl for au jus dipping gravy. Plan for each rib of the prime rib roast to serve two people. Carve only the portion of the prime rib roast you expect to be eaten at the meal. It is easier to reheat a larger piece of meat evenly than to reheat smaller portions.